Do not know what to do with so much redstone in your chests? 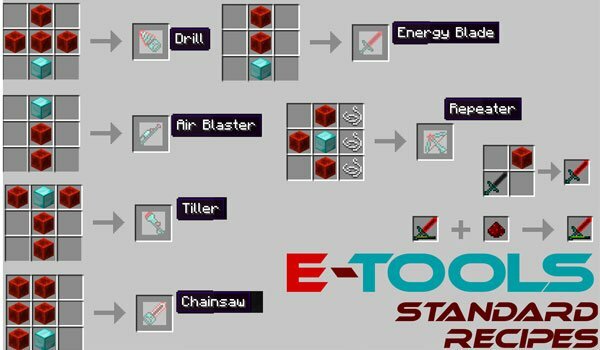 E-Tools 1.6.2 is a mod that allows us to develop new weapons, tools and armor that have the same power, speed and wear as the diamond ones, some have higher values, and they are really much more expensive to craft them. Chainsaw: Collect wood with a single blow. Tiller: Fertilize and cultivate 3×3 tracts of land. Air Blaster: Lets dig areas of 3 × 3 in sand, dirt or gravel. Drill: breaks stone and mineral with a single blow, and that allows you to break the bedrock. 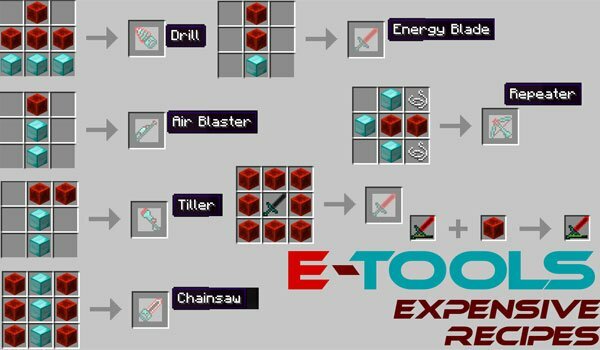 How to install E-Tools Mod for Minecraft 1.6.2? Paste the contents of the downloaded mod into “Forgexxxx.jar”. New weapons, new armor and tools!